We’re constantly working on updates to our mobile apps to make your WordPress.com experience on the go the best it can be. 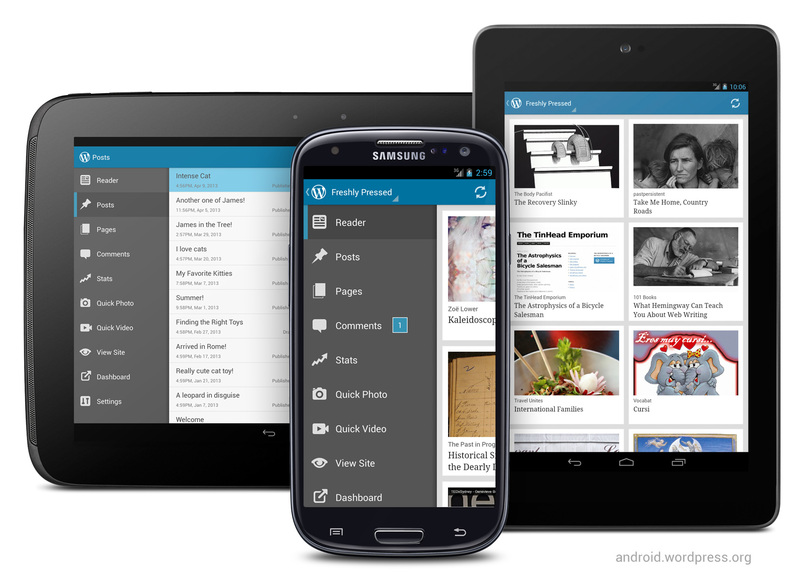 Today, we’ve jubilantly released version 2.3 of WordPress for Android to Google Play. After updating, you’ll see right away that this release includes very exciting updates to the user interface. Let’s dive in to what’s new! You’ll notice a fresh, new look. We’ve taken into account Android’s “Holo” style guidelines and implemented the Action Bar interface throughout the app. If you’ve used any other apps designed for Android 4.0 or higher, you’ll feel right at home with the new design. Your Action Bar provides easy access to common actions such as creating a new post, refreshing, and sharing to other apps. The older-style dashboard interface has been replaced with a Menu Drawer for quick and easy navigation to other areas of the app from wherever you are. You’ll find all of the same actions the dashboard had, but with the addition of some nifty new ones. To access the menu, simply tap the arrow next to the WordPress logo — in the top-left corner of the app — or swipe from the left side of the screen. If you’re on a large tablet device, the menu will always be visible, which takes advantage of the extra screen space. If you have multiple blogs in the app, you’ll see a drop-down list at the top of your Menu Drawer that you can access to quickly switch to another blog to work with, right in the app. When you leave the app, it will remember the last selection you made in the Menu Drawer so when you return, you can pick up where you left off. View Site option. A View Site option has been added to the Menu Drawer so you can view your blogs from within the app. Admin area access. You can access the wp-admin areas of your WordPress.com blogs by loading the Dashboard option in the Menu Drawer. Faster loading. The WordPress.com Reader now takes advantage of caching for faster loading. Updated look and feel. Settings have been converted to use the Android standard for preferences, giving them the Holo look and feel on supported devices. Many views have been updated to the Holo look and feel as well, including the post editor and all list views. Improved post editor experience. The post editor now has an expandable content area, which makes it much easier to navigate around the post content when you’re editing. Improved image uploading. If a post has an image but fails to upload the image, the post will be saved as a draft first — instead of published — so the image upload can be corrected. On a device? 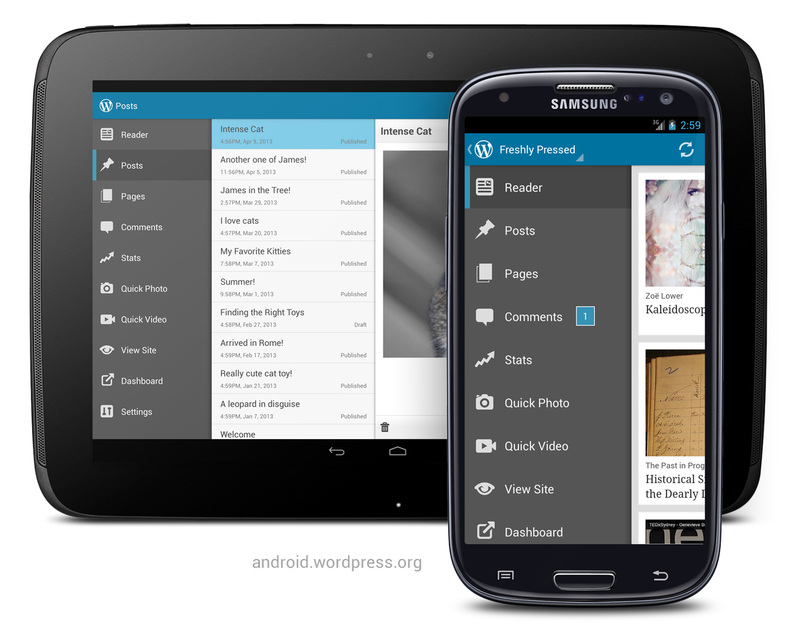 Tap here to download WordPress for Android directly. If you’re not on Android you’ll instead get redirected to the app for your device. This update was a big one and we want to make sure to keep the momentum going. We’re currently looking at adding notifications to the app so you can keep up with what’s happening on your WordPress sites while mobile and on the go. What would you like to see added to the app? Don’t forget that WordPress for Android is an open source project. Want to get involved? Check out make.wordpress.org/mobile to get started. 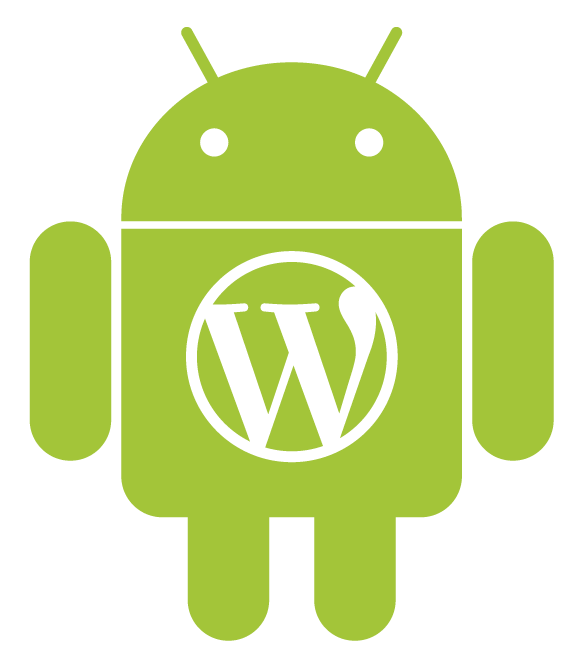 Follow @WPAndroid on Twitter and the WordPress for Android blog for the latest updates on WordPress for Android. And indeed it looks good. Loads quickly and reacts well… good to know maybe my holidays will not be entirely postless. It looks good! Thanks for this update! What about the iPhone app? My app has stopped allowing me to post photos!! It was temperamental before but now I’m self hosted it doesn’t allow ANY! We’re actively working on improving the stability of the WordPress for iOS app. If you’re interested in helping out testing or contributing, head on over to ios.wordpress.org. I’d love to be involved in testing an upgraded iPad app. Wow! Can’t wait to play with it. Looks great! When will the new iPhone app come out? Works great on my Nexus 7 – lovely job. The screen under the top bar when you scrolling up or down is blinking is that normal??? The rest is awesome! Excellent job… bravo! Does the Android have to be a phone? Mine is not. WordPress for Android works great on phones as well as tablets! Love it! One feature I wish WordPress had in general including on mobile app is a search option for Blogs I Follow, where I would be able to search by blog name rather than scrolling through list. Just downloaded it and what an improvement, thanks. Dowloaded and LIKE! Looks great…after a few taps of getting used to the new format..love love love!!! Thank you for giving us a wonderful platform to write, create and contact! Now, if you could make it stop heating up my phone…. seriously. I like the new setup. Thanks. I just downloaded the update. Can’t wait to use it. Looks awesome. I was going to leave a reply on the WordPress page on Google+ but it doesn’t seem to be very active (even with 21,899 people following). What about windows phone 7/8? As the blackberry 10 app is an android port, are you planning on updating it too? Or maybe you are working on a native app? Yes, we will update the BlackBerry 10 Android App as well. I hate using an internal browser, and would rather that the apps just open the browser I set as my default browser on my Android device. You can tap the web ‘globe’ icon in the Action Bar to open the page in the browser. It would behoove you to make a mobile-friendly “dashboard”… I do everything from my phone and that page is impossible to use. 2 days ago what was left of the last version ate all extra spaces and “returns”, making a visual word puzzle into one long sentence. I redid all the formatting, and still all the extra spaces were reduced to one in each gap. Never had that issue before, had to trash the whole thing, hope that doesn’t happen again. I enjoy using WordPress, but since everything I write is made up on the spot and never reviewed or edited (I don’t even read them when I’m done) so malfunctioning interfaces destroy ideas. Everything else is awesome though, I love how easy it is to cough up a post on demand without any prep. Great improvement in this version. Well worth trying this version out. Like the menu on the side, but, as a non-English speaking person, I have to point out: the translations of the menu options are terrible. I must be missing something! I wanted to do a quick edit to a post which I noticed from a browser view needed correcting, when I launch the WordPress Android App I cant seem to locate any ‘search’ option! Surely im not expected to scroll through my 350 posts to try and locate it! I hate the update it is just like the app for iphone if I wanted to use an iphone I would. Change is not always better. It’s all right but can you fix it so it scrolls automatically when I’m typing my post? Ever since the updated it won’t let me log on, so I now have to go online instead! Ho hum! That’s wonderful. I hope the iOS app will be bluer soon. Love the blue in the action bar. I love the upgrade! It makes reading on the go so much more fun and accessable! Something nice about the Android app is that the images I post to top my text posts don´t have that black line around them. I wish the regular “computer” version of WordPress had that same feature. Talking about photos again… when I upload a pic on android, it never makes it as a big format, only 500×375 pixels. I can’t find any settings to upload the image in a bigger format anywhere. What can I do? You can either tap on the image in the post editor to change the size or go to the blog settings in the app and set a reize setting there that will always be applied. I love the new look, but I still find it more easy to use my computer to do most posts compared to my smartphone. However, I am lovin the new look on tablet!